Today’s banking customers are a demanding bunch. They expect mobility, transparency, instant access, and competitive products from their providers. In response, financial institutions are hard at work optimizing online and mobile banking. However, all too often, the solutions and apps they create fall short of the mark. At the same time, technology advancements are making it easier than ever for small, agile fintech startups to quickly turn ideas into marketable products across multiple channels, including wearables. To compete in the digital age, banks must deliver smart, friendly technology, and they must do it quickly. The best way to do this is to partner with the experts. Leading banks and fintech firms need one another to thrive, if not survive. 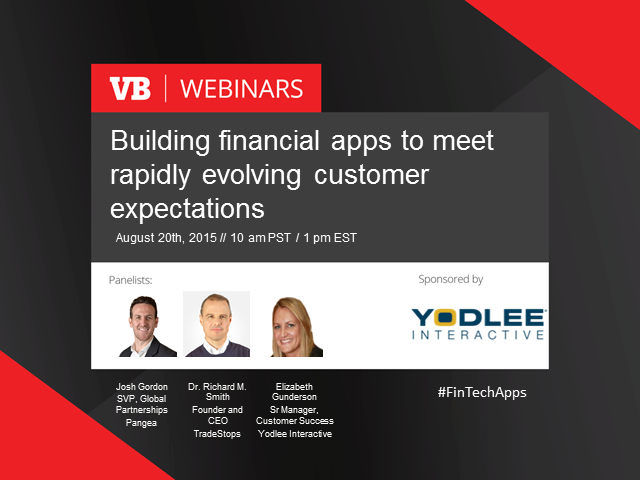 Join Yodlee Interactive for a webinar hosted by VentureBeat on August 20th at 10 a.m. PT, featuring panelists Josh Gordon-Blake, SVP of Global Partnerships at Pangea, Dr. Richard M. Smith, Founder and CEO of TradeStops, and Elizabeth Gunderson, Senior Manager of Customer Success at Yodlee Interactive. Don’t wait. Register now. And follow the discussion using #FintechApps on Twitter and other social media platforms.